COACH PETRINO: We’re coming off of a very good team win where I thought we played well in all three phases, defense, special teams and offense. It was a great atmosphere. I’m really excited about our fans. Appreciate everything they did for us. Now we’ve moved on to Marshall. We’re looking forward to traveling to Marshall, playing in a place we know is going to be a loud, hostile environment. We’ve got to have a great week of practice and go down there and play well. THE MODERATOR: Questions for Coach Petrino. Q. Did you have an update on Chucky Williams or Shaq Wiggins, some of the guys that got banged up in the game? COACH PETRINO: We had most our guys out at practice last night. They did well. You always worry about if they take a step back or if they continue to progress. We’ll know more as the week goes on. Q. Chucky was one of the guys that was back last night? COACH PETRINO: He was out at practice, yes, sir. Q. With yourself this week, have you taken some personal satisfaction to see the success you personally are now having with this team, given how things were maybe five years ago? COACH PETRINO: Actually, we’re just going business as usual. We go through the exact same routine. I thought we came out and did a good job on Sunday night in running with our vets, our young guys practiced real well. Then it was the players’ day off on Monday. As staff, we grinded away with the game planning. Came out with the normal practice yesterday. Everything is just business as usual. Q. With Lamar’s progress this year, did you see this coming? Was there a certain aspect of his growth or evolution in the off-season or the pre-season that made you think that he’s going to take it up another notch this year? COACH PETRINO: He had a really good off-season and spring practice. I knew after a couple weeks of spring ball that he was really doing a great job throwing the ball, going through progressions, starting to really understand the offense, what defenses were doing. Then he just continued to work hard and improve on a daily basis through camp. Very proud of his work ethic, his concentration, the maturity that he’s shown. Q. I know coaches take them one at a time. Looking at the schedule, this is what most people would call a classic trap game. Top five team last week, played great. You have a top five game coming up next week. Is there any concern or difficulty in getting your team focused to play this game this week against a lesser opponent? COACH PETRINO: You have concerns every week about going through the preparation the right way, making sure we’re focused and concentrated in the meeting room. So it really is just continuing to go through the process. We have a mature team, so we’ve challenged them to make sure they focus and concentrate and prepare for a game. We don’t have that many games left, particularly our senior class. So we’ve got to go out and take advantage of every time we get to go out on the field and play. Q. I’m wondering about the challenges Marshall faces. Passing game was effective last week against Akron. Is that the chief concern or something else they do that might be more dangerous? COACH PETRINO: I mean, they can really throw the ball. They’ve got great schemes. They’ve been doing it there for a long time, so they really understand what they’re doing. They’re very, very well-coached, and they got good players. Q. Just wondering about the offensive line. Seems like that might have been their best performance in quite some time. What were your thoughts on how everybody graded out, how they played against Florida State? COACH PETRINO: Yeah, they had a good day. They really worked hard together. They played with great effort. We’re getting better technically, so we’re utilizing our technique, continuing to grow. They’re providing a lot of leadership. That’s good when your offensive line provides leadership for the rest of the team. I was really proud of the way they competed, how hard they played in the game. Q. Obviously what you can say, across the country Lamar Jackson is a focus, talked about with the Heisman at all times, as his head coach how you’re pushing him to go to the next level, what you’ve seen on him on film? 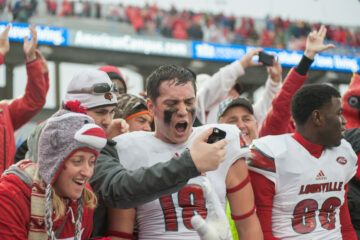 COACH PETRINO: He’s just a really fun guy to coach. He comes to work with a smile on his face every day. He goes out and competes and plays hard and practices hard, is loving getting better, preparing and going through the process. I’ve just really enjoyed how much he’s improved, how hard he pushes himself, and how much he’s grown as a leader for our football team. Q. As far as his receiving corps, what can you say about the weapons you have? There’s a lot of focus on Lamar Jackson, but obviously guys have to catch balls out in the field. 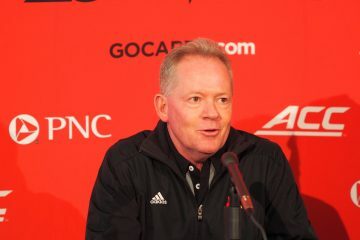 COACH PETRINO: No question about it. A quarterback always plays a lot better when the 10 guys around him do their jobs and play real well and excel at what they do. We have a good receiving corps. They’re fast. We have some good size and hands there. Also tight ends that can run and catch, run block. We’ve been able to throw the ball to our backs. That’s helped us a lot. That helps open up things downfield. That’s a credit to the skills our backs have, but also the fact that Lamar is going through progressions and dumping the ball off. Q. What do you recall about the recruiting process from Lamar in terms of what you heard about him, what your coaches were telling you about his talent? When you think about that process to where he is now, could you have really imagined how far he’s come in that period of time? COACH PETRINO: I mean, everybody that we talked to in south Florida knew who Lamar was. They all respected his ability, how hard he played. I really liked the process in recruiting him, his personality, how motivated he was, the goals that he saw, the success he saw in front of him. Just proud to get him here, the fact that he’s continued to work extremely hard to get better. Q. Was it kind of an easier process than you imagined back then? COACH PETRINO: No, I didn’t think it was easy at all. We had to grind away. I didn’t know even till the last minute whether he was going to Louisville or not. THE MODERATOR: Coach, thanks for being with us today.